Physical 48GX/50g connected to Windows XP and Linux. 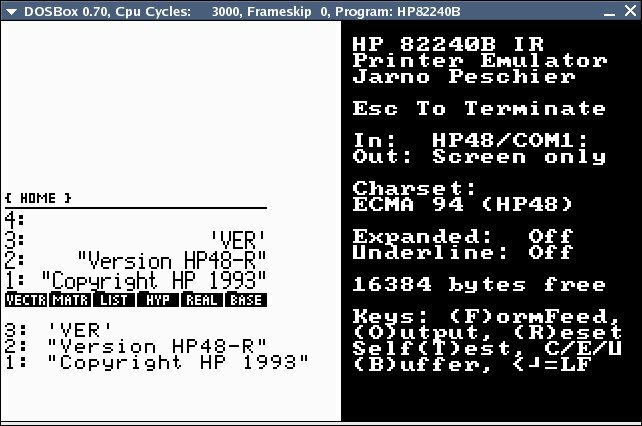 Virtual 48GX/50g EMU48/Windows XP Printing. The freely available DOSBox and Jarno Peschier's DOS-based 82240B Emulator will be leveraged to provide this functionality. The DOSBox DOS Emulator (http://www.dosbox.com). Jarno Peschier's DOS-based 82240B Emulator (http://www.jarno.demon.nl/ftp/hp82240b.zip). 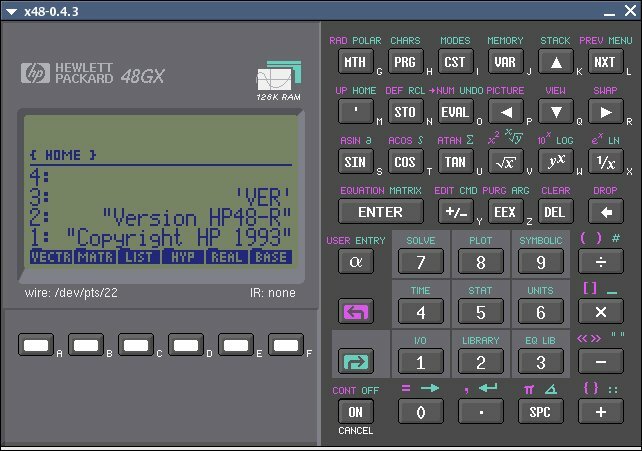 A calculator with a serial port, e.g. 48GX, 50g. The proper calculator serial cable (50g users will need this: http://commerce.hpcalc.org/serialcable.php and this: http://commerce.hpcalc.org/nulladapter.php). If you do not have a serial port, you will need a USB to Serial adapter (my favorite: http://www.keyspan.com/products/usa19hs/) NOTE: This may be configured as any COM port number or TTY. NOTE: Linux/50g users have the option to use USB as a serial port. This will eliminate the need for a 50g serial cable and a USB to Serial adapter. See http://hptalx.sourceforge.net/hp49gplus.shtml#AEN35 for details. 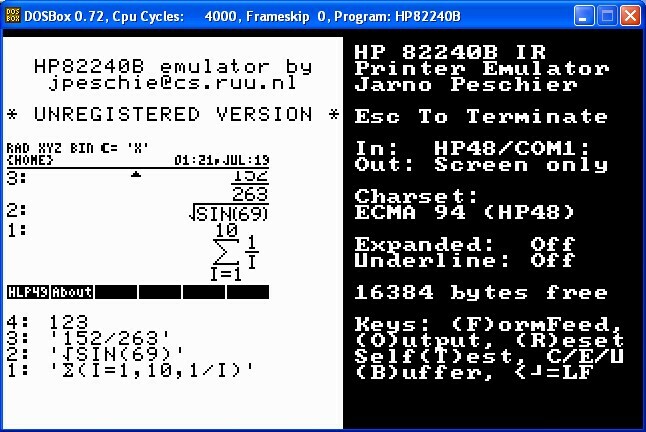 Jarno Peschier's 82240B Emulator is DOS-based. A DOS environment with a serial port and CGA graphics is required. Although it is possible to run DOS applications within Windows, this particular program does not play well with XP. DOSBox is both an x86 emulator and a DOS emulator bundled as a single easy to install package. Of all the solutions capable of providing a platform for legacy DOS applications; DOSBox is the best. DOSBox is available as source or binary for just about every popular platform. I have tested DOSBox on Linux/x86, Linux/ARM, OS/X/Power, and Windows XP without issue. Linux users can choose to use DOSEMU instead of DOSBox. DOSEMU performs better since it does not need to emulate the x86 microprocessor. This article will only focus on DOSBox since it is ubiquitous across all platforms. Mac users (Power and Intel) should also use DOSBox. Since I do not have a Mac handy you're on your own. VMware and other similar solutions will work as well. 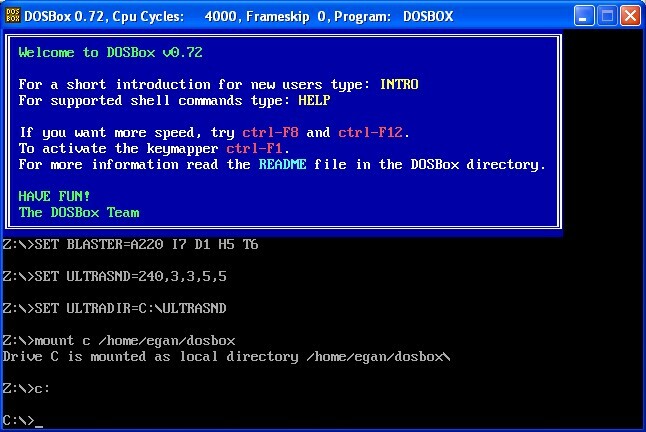 Create a dosbox directory in your home directory (or anyplace else you like). Edit DOSBox.conf. You can just launch DOSBox.conf from Start/Programs/DOSBox-0.72. Scroll down and look for the [serial] and [autoexec] sections. Where comn is your Windows COM port, e.g. mine is com4. NOTE: Your Linux serial port device may be different, e.g. if connecting your 50g with USB and if you have USB Serial setup (http://hptalx.sourceforge.net/hp49gplus.shtml#AEN35) then you would use /dev/ttyUSB*. Check your documentation. If you are using DOSBox from within Windows a second window (DOSBox Status Window) should have also appeared. DOSBox errors and warnings will appear here (you can ignore any FIFO warnings). Linux users will get the same text in the terminal session that launched DOSBox, and Mac users will get the output from the system console. Now, type exit to exit DOSBox. 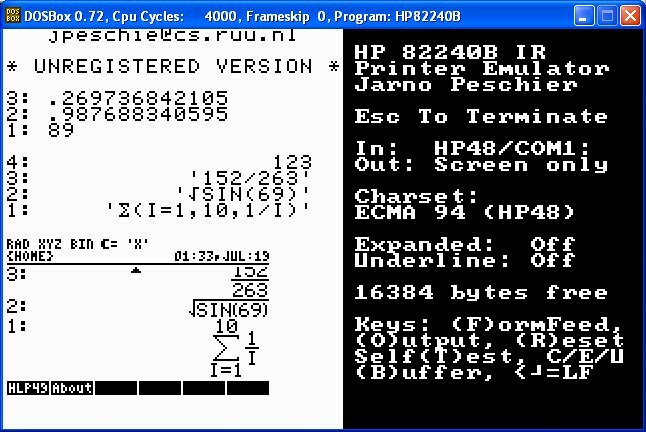 Jarno Peschier's DOS-based 82240B Emulator is relatively ancient. Of the four emulators I was able to find this one was the most feature rich and worked on Windows and Linux without any issue. 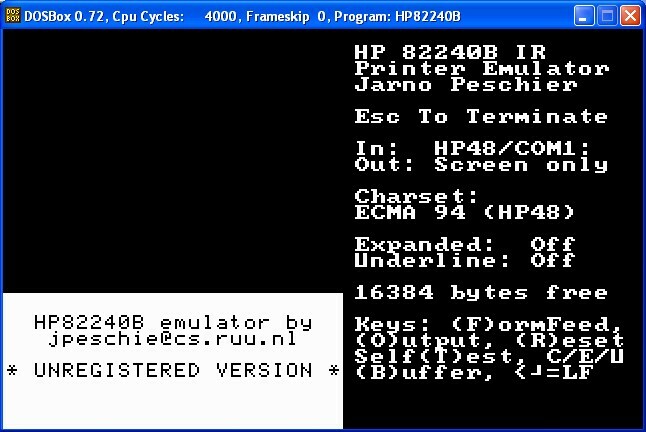 Create an HP82240B directory in your dosbox directory. Download http://www.jarno.demon.nl/ftp/hp82240b.zip and extract in your newly created HP82240B directory. NOTE: Linux/Mac users, the file must be DOS formatted, i.e. terminate with CRLF each line. After you see the splash screen (the rest of the snapshots in this section will be 50% reduced in size. You can right click and download the full-size version if you like). Now simply connect your calculator to your serial port, setup for serial print, and print something: NOTE: Refer to your calculator documentation on how to switch from IR to Serial print. Both Linux and Windows can read PCX files. 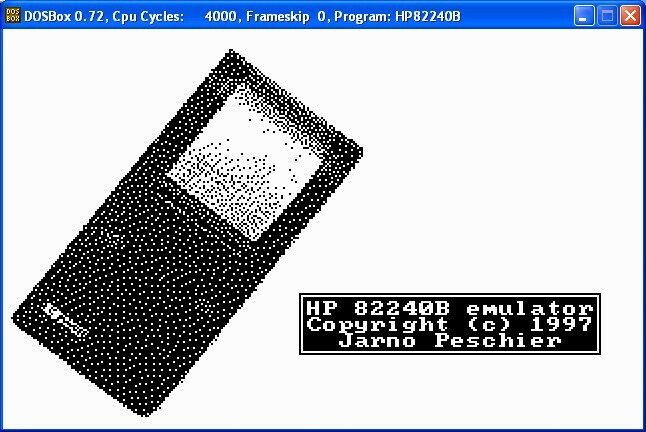 If I look in my dosbox/HP82240B directory I should see a HP48_001.PCX file. 07/19/2008  01:40 PM    <DIR>          . 07/19/2008  01:40 PM    <DIR>          .. If you have been following along then congratulations! 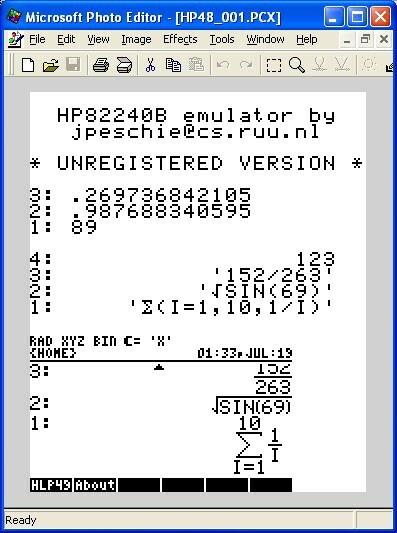 You have successfully emulated a 20 year old printer, a 27 year old operating system, and a 23 year old processor just to print output from a 15 year old calculator (48GX). NOTE: Although all the screen shots are of Windows, the Linux output sans the borders is exactly the same. Ok, that was easy. How about virtual calculator to virtual printer printing? 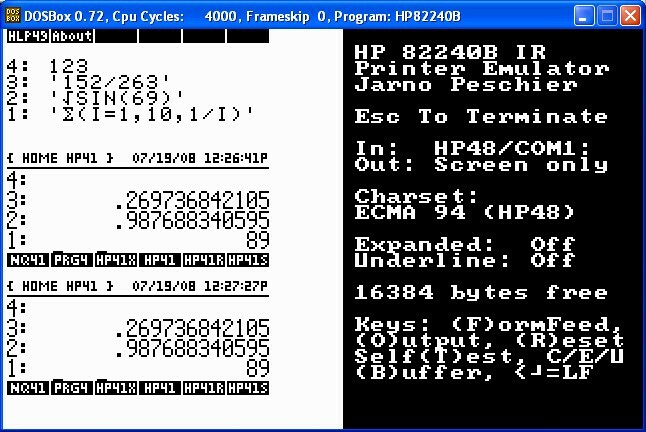 Printing from EMU48 is really no different than a physical calculator. To enable this you will need a virtual serial cable. Download and install: http://com0com.sourceforge.net/. NOTE: With com2tcp you could print or transfer files across the Internet to your friend. To configure com0com launch Start/Program Files/com0com/Setup Command Prompt. You should be greeted with a "command>" prompt. The New Hardware Wizard should launch (twice) to confirm the installation of new "hardware". Type quit when you are done. COM10 and COM11 were arbitrary, it could have been any pair of unused numbers. Exit out of DOSBox and change the configuration file to use COM10 instead of the previous value (COM4 in my case). Restart DOSBox and startup HP82240B. Verify that COM10 was opened (look at the DOSBox status messages). Launch EMU48 and go to File/Settings.../Wire and select COM11 from the dropdown box. Setup 48GX or 50g for serial print. Notice the "wire:" label under the left side of the LCD? The value (/dev/pts/22) is your "null modem cable". That was easy! Now put your rendered useless 82240Bs on eBay (I still do not have one).